Heat oven to 350°F. 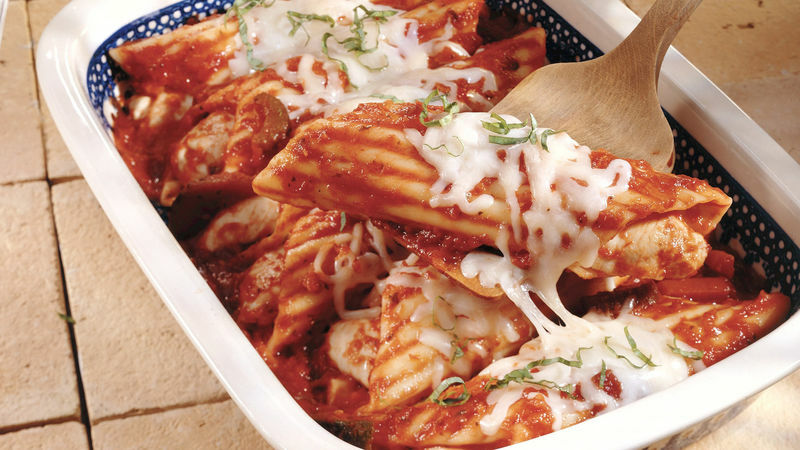 Spread about one-third of each jar of pasta sauce in each of 3 ungreased rectangular baking dishes, 13x9x2 inches. Sprinkle garlic salt on chicken. Insert chicken into uncooked manicotti shells, stuffing from each end of shell to fill if necessary. Place 14 shells on pasta sauce in each dish. Cover and bake about 1 hour 30 minutes or until shells are tender. Cheese crisps make a special added touch! For each crisp, place about 1 1/2 tablespoons shredded Parmesan cheese on foil-lined cookie sheet. Broil 2 to 3 minutes or until golden brown. Make pans of manicotti the day before the party; cover and refrigerate. Bake manicotti about 2 hours before guests arrive.